Review Summary: On the whole AHISTA AHISTA has decent merits. But lack of face-value will prove to be a stumbling block from the box-office point of view. On the whole AHISTA AHISTA has decent merits. But lack of face-value will prove to be a stumbling block from the box-office point of view. Hrishikesh Mukherjee may be breathing his last. But his brand of simplen-effective story telling will continue to live with the likes of Shivam Nair. 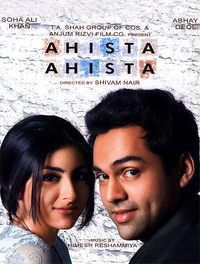 For Nair takes you completely by surprise in his masterly crafted love story 'Ahista Ahista' that tickles your funny bone with cleverly written lines by writer Imtiaz Ali and a sedate story line that seldom compromises on the objective. The whiff-of-fresh-breeze stars like Abhay Deol and Soha Ali Khan add their Glorious Charm in a film that's a complete revelation with its nascent effervescence. 'Don't reveal the end,' goes the old Bollywood refrain.